Clean Check® extendable backwater valves prevent sewage backup into a building as a result of a plugged sewer system, excess volume in the system or groundwater flooding. They are designed to be installed easily outside a home, business, or other structure without using a costly manhole, and are readily accessible for maintenance or cleaning. The extendable valves consist of a tee-shaped valve body, a top collar and a bottom collar with a replaceable PVC flapper attached. In the event of back-pressure, the flapper blocks the reverse flow and prevents a sewage backup. If you do not have an extendable backwater valve you could be at risk. If the river overflows by as little as 18 inches you may soon find sewage coming back up into your building from every point it once went down. Having raw sewage flow out of your toilets and sinks is not only smelly, but a dangerous biohazard that can cause thousands of dollars worth of damage. Many buildings not at immediate risk of flooding are at risk of a sewage backup. Once the flood waters come it doesn't matter if the water reaches your doorstep, it will already be in your sewers. Call Us at 253. 872. 7222 for helpful advice or to inquire about our products. Archer Construction has been serving the Green River valley for over thirty years and brings expertise in water, storm, and utility systems and fire suppression systems..
A simple and low-cost solution for backwater headaches. No manhole with exterior installation. Installs up to 12 feet deep. No more coordination with the concrete contractor to pour inside pit. Eliminates need for interior installation. No more backwater valves under doorway, cabinets, stairwell, floor covering, etc. No more sewer gases or mess into the building during maintenance inspection. 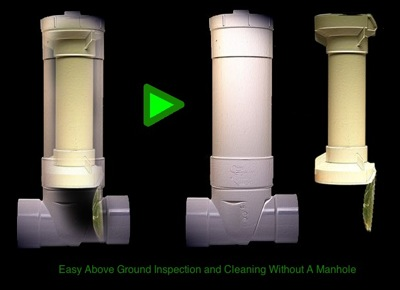 Easy to perform maintenance & inspections from ground level. Outside installation eliminates health risks inside building.